Our new model numbering system is convenient and easy-to-use for the manufacturer, dealers and customers. 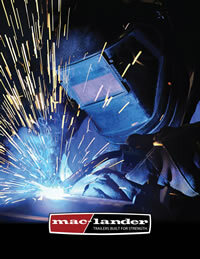 With this in mind, Mac-Lander has developed a new simplified numbering system that incorporates past numbers, all model characteristics, and a uniform sequence. Now each of the Mac-Lander Trailer product model numbers will contain eight characters, combining letters and numbers. The first 2 numbers tell the deck length, 3rd digit is the style trailer, the next 2 digits (4th & 5th) indicate the frame or series, the next digit (6th) denotes the flooring and the last digit (7th) denotes the tail configuration. The model number may also be followed by an 8th digit that denotes paint color. Example: 18TSLWB-B indicates an 18-foot, tag-along, skid loader trailer with wood floor painted black.